As you seek the perfect tree with your family this season, may you also find the true meaning of Christmas. Our trees are specially attended to, from seedling to cut-ready Christmas tree. They have been hand pruned and meticulously cared for. Come on out and cut yours beginning the day after Thanksgiving! All of our trees have good needle retention and should remain fresh through the holidays if kept watered. We recommend that you wait a little later in the season if you are planning on selecting a spruce tree. In general, we call the spruce a “3 week tree”, because they are more likely to begin losing their needles about 3 weeks after they have been cut. If you decide to take one earlier in the season then we recommend putting the trunk in a bucket of water immediately upon returning home and keeping it in the garage (out of the elements) for a week at least. No matter which tree you select, make sure to keep it watered throughout the season. We have plenty of hand saws available for you to use, but feel free to bring your own as well. However, no gas chainsaws are allowed. We also recommend bringing a pair of work gloves to make carrying and holding the tree a little easier. 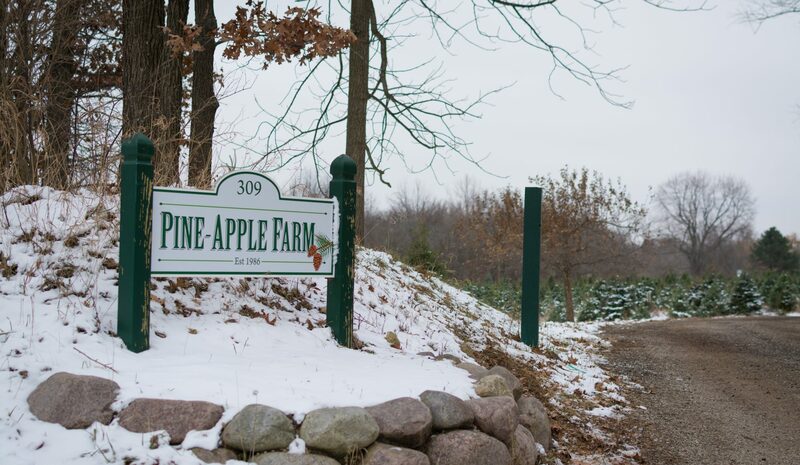 If you need assistance, a member of the Pine-Apple Farm team will be happy to assist in cutting down your tree. Also, if you are uncertain of the type of tree you have selected, don’t hesitate to ask us first before cutting the tree down. We encourage all of our customers to recycle their Christmas tree at the end of the season. Price includes tax, shaking and baling. These trees were cut for Pine-Apple Farm just before Thanksgiving. They have been sitting in buckets of water and should hold their needles throughout the holiday season. We will be happy to help you load and tie your tree onto your vehicle. As always, we will have baling cord available if you prefer to tie it yourself.